mid-range porcelain with inlaid underglaze. Born in 1978, the daughter of a painter and an organic dairy farmer, Hatch’s childhood was divided between physical labor, play and creating art. Hatch studied drawing, painting, printmaking and ceramics and received her BFA at the Museum School in Boston in 2000. After several ceramic residencies and apprenticeships in the US and abroad, she received her MFA in ceramics at the University of Colorado in Boulder in 2008. In 2009, she was awarded the prestigious Arts/Industry Residency in the Pottery at the John Michael Kohler Arts Center in Wisconsin which laid the foundation for her career as an artist designer with many retailers worldwide. Hatch’s work has been widely collected and commissioned and exhibited at art fairs nationally and internationally. Hatch is currently preparing for a major installation of her work at the High Museum of Art in Atlanta in February 2014 and has two forthcoming books to be published in the spring of 2015 with Quarry and Chronicle publishers. Since 2012, Hatch has been a visiting critic at the Rhode Island School of Design. Hatch works from her home studio in Northampton, MA and is represented by Todd Merrill Studio Contemporary in NYC. I work to translate and re-work this sourced historic imagery and pattern to the ceramic surface of a group of plates. The final artwork becomes an exploration of the relationship between the historic and the contemporary–crossing over categories of decorative art, design and fine art. Through shift in scale, color and context, the compositions of plates both abstract and highlight aspects of the imagery and patterns, encouraging a new dialog with object and surface pattern. Fascinated by how we live with objects, how and why we acquire objects and what happens to them throughout history, I see my work as a reflection of the life of surface pattern through the decorative art continuum and my research continues to collaborate with the museum and history. Our work focuses on vessel formats as platforms for utilitarian, conceptual and spatial investigations. We continue to have a focus on the strictly utilitarian. However, over the last few years one concept that has dominated our work incorporates forms and surfaces related to diatoms and viruses. This work is still meant to function as containers, pouring vessels or drinking vessels, but some of that function may be sacrificed for form and concept. Tactile considerations are still of importance in the utilitarian based work. However, form, surface and concept are all a primary focus in this work. The forms and surfaces of some viruses and diatoms have been a great source for abstraction. Our direction in both sculpture and utilitarian ceramics both feed one another. Historical and contemporary use of visual language and utilitarian objects are two main sources for research. Working within the context of sculpture along with the utility of ceramics allows us to communicate more than purely the use of the object and working outside of purely sculptural considerations allow the addition of utility and an intimate contact between the audience and the piece. Objects of use and domesticity have a common language, which a large and diverse audience can appreciate and relate to. This may be the initial draw to the work but appreciation of the concepts and esthetics may seep into the viewer after further investigation. The sense of humanity that a well thought out handmade object can obtain is not found in objects that can be purchased at Wall Mart or produced by the machines of industry. Thoughts about the user of objects are often negated for practical reasons such as economics, shipping or durability, and this many times results in objects that have no life or value of their own but fit very well into our disposable society. Furthermore, the content that use to be in objects of utility has turned to nothing more then trite or kitch reflections of hallmark holiday tributes. We have a firm belief in the connection of the mind to the hand and the hand to the media. Like the lips to a read, technology can not replace or even come close to the sensitivity that the artists has with his or her material. A major intent is to create tactile qualities in these objects that offer an intimate relationship with the user and provide the objects with an inherent value that gives them a life of their own. We cannot do this without our touch playing a part in the creation of the object. Generating a pleasurable and possibly a reflective experience when being used and viewed creates new challenges with each object made. Visual balance by using proportional perspectives, physical balance within the weight and pivot points of the piece along with tactile qualities are issues we address to achieve these goals. Ultimately, we want our objects to be used. With work that is firmly based in utility we still want an esthetic to prevail and at times we want conceptual concerns to also be inherent. It is almost more difficult to work within those restraints of a utilitarian piece because they are just that, restraints. Calligraphic work and textiles influence much of our utilitarian work. Using brushwork with slips and terra sigillata and the use of repetitive marks like a stitching pattern are reflective in much of our strictly utilitarian work. Square Plate, 1.5 X 8 X 8, slab built, earthenware, majolica decoration, electric fired C04 2013. I love to make pots that people are able to use everyday and I love to decorate. I combine these two loves in my work. My pots are made from thrown, altered and handbuilt sections. These sections are made separately and then assembled. I enjoy working in this way because it allows me to make pots of many differing forms and shapes. Pots that are oval and square as well as round. My decoration is a contemporary approach to the majolica of the Italian Renaissance. The floral motifs on my pots are patterns rather than actual representations that I use to divide and define the space in interesting ways. I try to integrate form, function and surface in order to create strong and exciting work. Work that is both beautiful and functional at the same time. 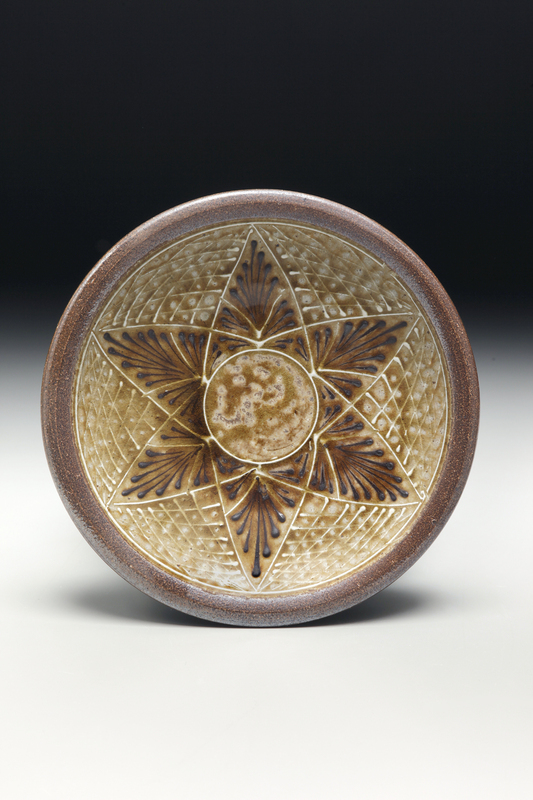 Alex Matisse Plate/Geometric Burst,2014, 11 x 11 x 1.5 Wood-fired, salt-glazed stoneware with ash glaze and slips. Born 1984, Alex Matisse grew up in a converted white clapboard church in the center of a small New England town to a family of artists. 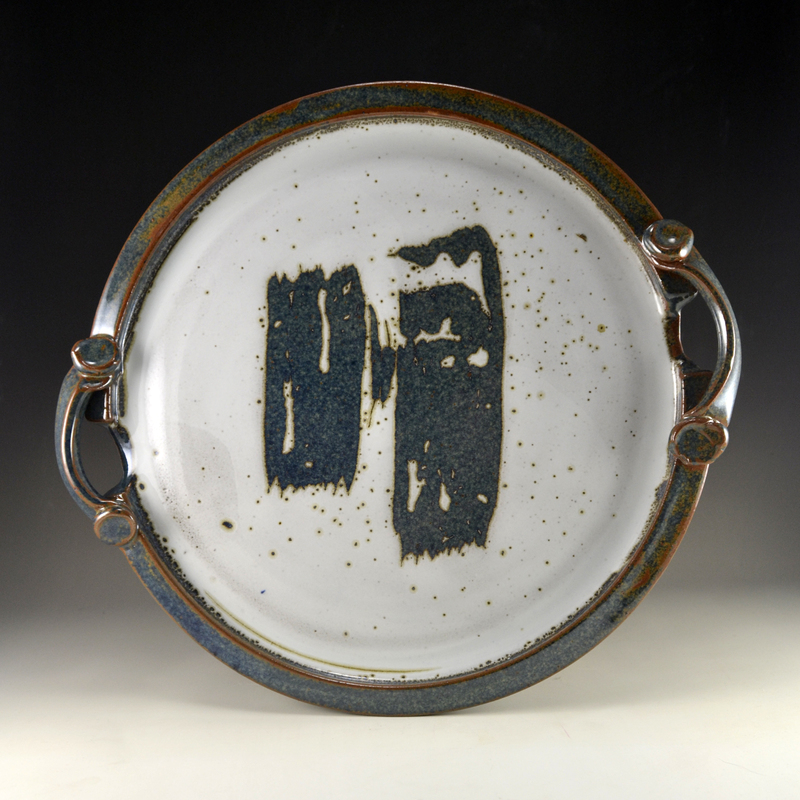 He apprenticed with studio potters Matt Jones and Mark Hewitt before starting East Fork Pottery in the fall of 2009.East Fork Pottery now functions as an atelier with John Vigeland having joined forces in the fall of 2013. They are working on a small range of dinnerware and porcelain lighting to compliment the rich and varied works from the wood-kiln. Matisse has exhibited nationally in galleries and museums and is currently working on a large solo exhibition at the Memorial Art Gallery in Rochester, New York which will open in April of 2014. His work has been featured in magazines and books, and he will be featured this April on UNC-TV’s flagship program “Our State”. The majority of my work is made in a fusion of preindustrial country traditions in both process and material. It is fired in a large wood-burning kiln and made of as many local materials as the chemistry will allow, while still affording me the physical attributes necessary for my aesthetic decisions. 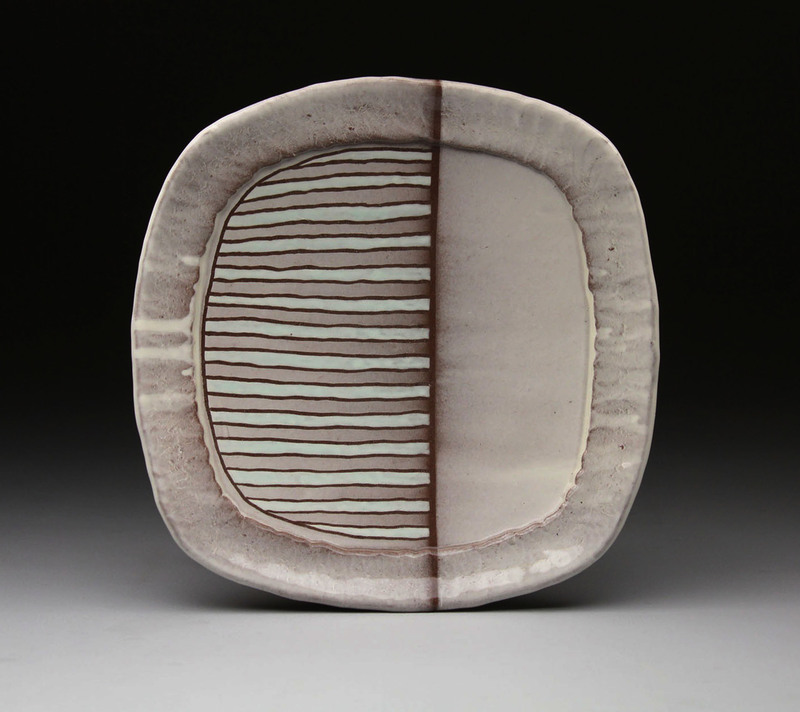 Lunch Plate, 2014, handbuilt earthenware with slip transferred pattern, cone 04, ¾” h x 7 ¾” x 7 ¾”. I earned my bachelors of arts in Art Education from the University of Wisconsin-Eau Claire. After graduating I taught middle school art for two and a half years in Guatemala City, Guatemala. While I love teaching, my heart was only half fulfilled; I am just as much an artist. I changed the focus of my career and started my journey in clay. After two years as a post-baccalaureate student at the University of Nebraska-Lincoln, I began graduate school as Kansas State University where I am currently in my third year. From surface to form and how my work is used, I see pottery as my vehicle to build understanding and compassion between diverse people and cultures. I am excited and motivated by the belief that my work can make a difference in the world. My work can be seen at www.laurenkarle.com. As one of the fortunate recipients of NCECA’s Graduate Student Fellowship in 2013, I served as an intern at Uriarte Talavera in Puebla, Mexico. This opportunity not only enabled me to learn a great deal about ceramics, it also enhanced my perspective on language, tradition, and culture, bringing clarity to what drives my career. I spoke Spanish all day at the factory and all night with my homestay “mom.” Reflecting on cuisine and the history of Talavera, I realized that Mexico is a mix of many cultures, not just Spanish and indigenous. I cooked with people whose heritage spans the globe and whose recipes combine traditional Mexican flavors with ingredients from their different backgrounds. I also learned ceramic techniques that have been passed down from generation to generation, tested and modified for success over hundreds of years. The relationships I developed made an indelible impact on me as a person and an artist. I feel that I have barely scratched the surface of potential for working at Uriarte and in Puebla. I hope to return to expand what I started and to further connections between cultures and within the community. Thank you to NCECA and all its supporters. I can honestly say this experience has changed my life. From a personal standpoint, I’m probably doing the best work of my life. Because I’m more mature… taking my time… thinking about what I’m doing as opposed to just making a bunch of pots. I’m actually thinking about each piece as a representation of my professional standard. My work is a reflection of Manchester Craftsmen’s Guild, not just me. It’s a very professional standard, so that the students walking through this place think, “He’s pretty good… I want to be like him.” That’s very gratifying. I’ve developed a philosophy about my work. Basically, I’m into utilitarian thinking. Simple is better… it’s got to be the pot and the glaze, period. That ought to carry it. If the pot’s good, it ought to be able to say exactly what you want it to say with the pot and glaze, that’s it. That’s sort of my philosophy, very much like the Shaker furniture movement, where less is more. Shaker furniture is very minimalist, they just use wood and maybe a little decoration, but not much. That’s really what I feel most comfortable doing with my pots. I’ve decided to be comfortable with what I do and do it very well. So that when you look at a piece, it has presence and strength, and a sort of integrity to it. Pure and simple. Todd Hayes was born and raised in the foothills of the Wasatch Mountain Range in Utah. He received an Associate in Arts and Sciences from Utah Valley University in Orem, Utah (2004), a BFA from Utah State University in Logan, Utah (2007), and an MFA, from Wichita State University in Wichita, Kansas (2010). Before returning to University, Todd worked as a carpenter, making molds and crafting original architectural elements. Having spent much of his childhood in the hills, he gained an acute awareness of nature. His work evolves from these experiences, looking at the balance of nature and our constructed realities within. Todd’s work has been exhibited nationally in numerous group and solo exhibitions and is included in the Nora Eccles Harrison Museum of Art’s permanent collection. 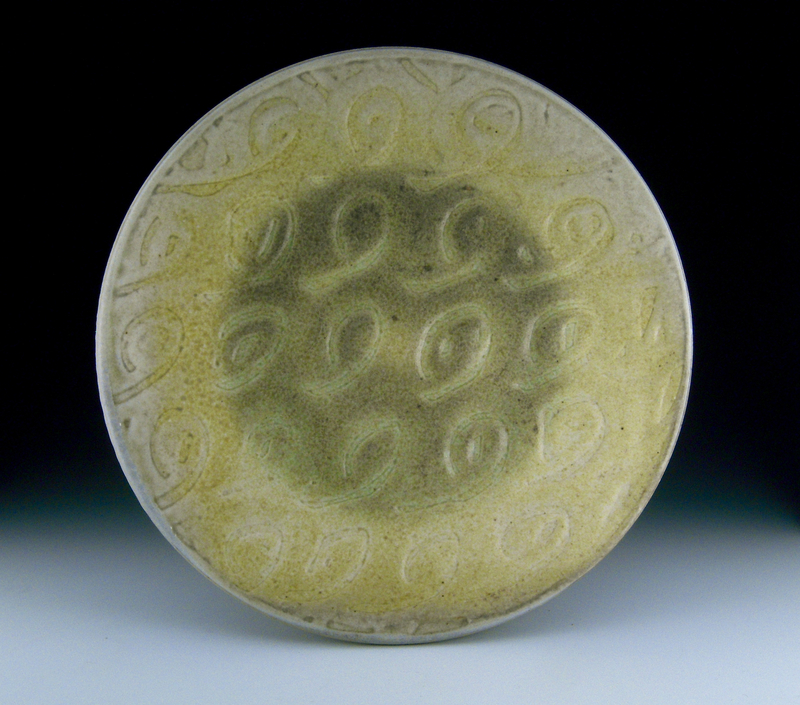 Todd currently lives and works in Logan, Utah where he is the Ceramics Studio Coordinator and Instructor in the Caine College of the Arts at Utah State University. For this plate in particular, I wanted it to be visually striking in terms of their being a balance between the surface decorations and having a physically inviting form. Ultimately, the form was dictated by the decoration, as simple as the stripes are – I felt they needed a frame to contain them so they didn’t visually run off the plate. This is how the squaring of the plate and the added rim took shape, a formal necessity to contain decoration, but also to add an organic rhythm that plays off the repeating stripes. Being receptive to what my work needs visually has always been an integral part of my studio practice. 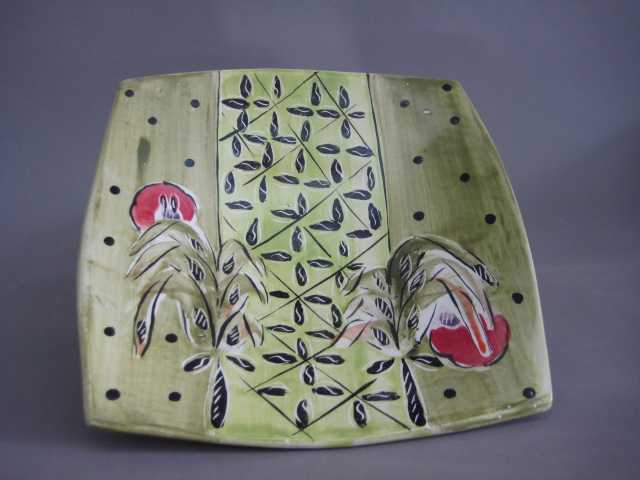 This plate is the result of the interactions that take place between the maker and the object. Enjoy. My ceramic works are influenced by European earthenware pottery and porcelain traditions from the 13th through the 18th centuries. Both “peasant” and “palace” pots inspire me. In the former it is the casual, perhaps careless result that excites me: the drip of glaze, the impurities in the clay, the globs of kiln-shelf refuse fused to the bottom. These imperfections often enliven the pot in ways that take my breath away. In the latter, the elaborate rendering of form and surface common to porcelain factories such as Sevres and Spode, fuels my imagination. Early English slipware, Delftware, and Italian maiolica are sources I refer to often. I am attached to terracotta and low-fired technologies as symbols of my heritage. I like to imagine a potter ancestor in Luxembourg or Wiltshire pouring slip on his earthenware platter, decorating it with the details of some local or family event, sprinkling on lead oxide, then firing it in the most simple manner. He was an essential member of his community, whereas I am at home in the art world. But my ancestor and I are alike in our interest in enlivening the daily aspects of life: mundane routines and community celebrations. Like him, I hope the plates, platters, bowls and other service pieces I make enhance those routines and rituals and that they add a touch of grace to the domestic arena. Kirk Lyttle works out of his basement studio in St. Paul, Minnesota. He woodfires his pots with Linda Christianson and Jil Franke in Linda’s double chambered Bourry box kiln about an hour north. On the side Kirk is an illustrator and graphic artist for the St. Paul Pioneer Press. His work in this capacity shows up with some frequency in publications from Anchorage to Miami. While Kirk has received some flattering attention for his work in both disciplines he is perhaps best known for his brownies. I’d like my pots to appear as though they were knocked off on a whim; the drawings to have been done for my personal amusement. If some of them have acquired an aura that transcends these inauspicious beginnings I’d like it if this were attributed to the mysterious atmosphere of the wood fired kiln. Bake till a toothpick comes out almost, but not quite, dry. Start checking at 35 minutes. Check sooner if using a 9“x13” pan. James Tingey is a ceramic artist whose atmospheric fired vessels explore ideas of utility, process, material and landscape. 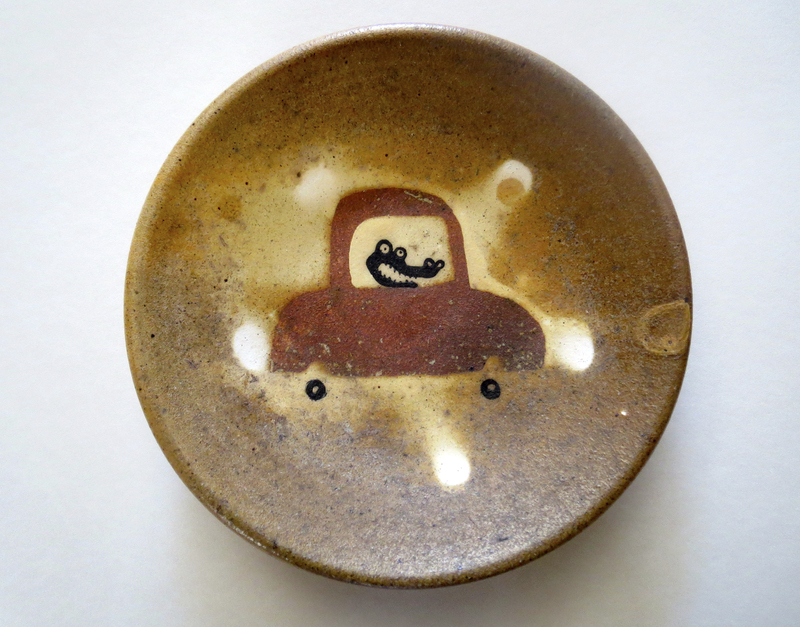 Originally from Corvallis, Oregon, he received his MFA-Ceramics from Ohio University in Athens, Ohio in 2012. 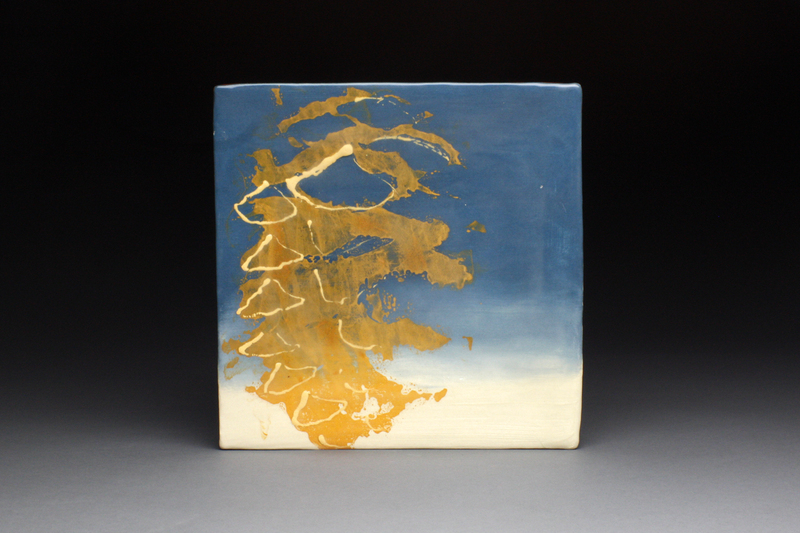 He has exhibited his work widely in over 40 nationally juried and invitational shows since 2006 including five consecutive Strictly Functional Pottery National exhibits, and received awards from the 2012 Clemson Ceramics National, and Studio Potter Magazine in 2011. His work as been featured in 500 Cups, Woodfired Ceramics: 100 Contemporary Artists, and 500 Teapots, Vol 2. James currently is Instructional Associate in Ceramics and Sculpture at Brookhaven College in Dallas, Texas. My work is a material articulation of the relationships, origins, and roles of functional objects and their interactions between landscape and utility. Utilizing a vocabulary of functional ceramic objects, my work explores material and process as a vehicle to articulate relationships between object and containment, body and environment. My work explores relationships between functional considerations and process; an engagement that relates the hand to environments. Through the use of landscape and process residues I seek to connect the viewer to the transformation of material into object. I am invested in the activity of mark making as a record, directly through the index of the hand and indirectly through the residues of firing. I am interested in utilizing a variety of forming methods, and the inherent residues of processes of hand building, wheel throwing and mold processes. Traces and layers of process are evident through the residues of forming and firing, engaging in a visual and tactile dialogue that is discovered through use. These residual marks engage the viewer through the traces of touch and the history of the object.